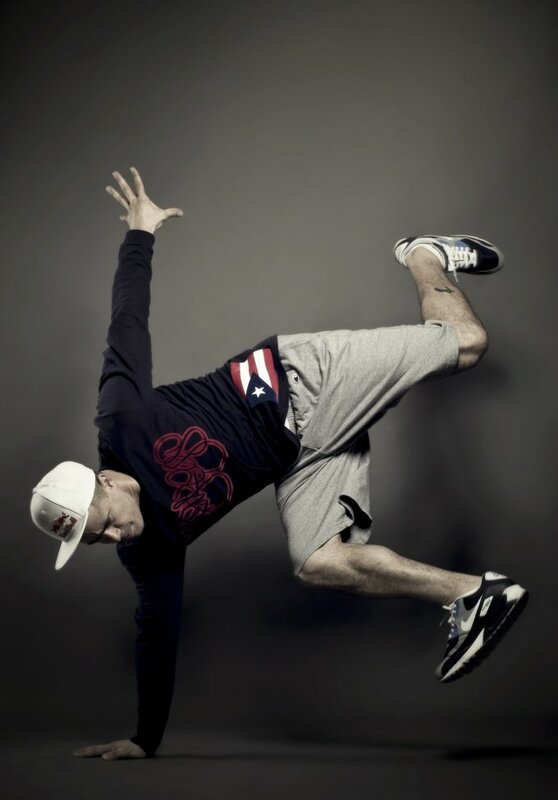 Bronx native Crazy Legs is known all around the world for his influence on the culture of b-boying. As president and founding member of the renowned New York-born Rock Steady crew, his accomplishments include becoming the motivating force behind the revival of b-boying in the early 1980s, as well as pioneering the continuous backspin (the classic b-boy move known as the "Windmill"). We talked with Crazy Legs about Rock Steady crew&apos;s 37th anniversary, his traveling, and his involvement with the Puerto Rican community, ahead of tonight&apos;s Red Bull BC One North American Finals in Las Vegas (watch the livestream on August 15, 2014 at 9 p.m. EST here). Sometimes when you have nothing, knowing that people know you exist makes a big difference in your life. It helps you to strive for something. What do you think your greatest accomplishment as a b-boy has been? Has it been anything to do with your actual performances, giving back and teaching, or something else? I would have to say it&apos;s something that came a lot later in the game. In 2008, I worked on a project called Bouncing Cats. It&apos;s a documentary I appeared in that was produced by Red Bull Media House. Just having the opportunity to go and see a whole situation that I could probably never imagine, especially with what I had previously thought was growing up in a harsh and bad environment. It was nothing compared to how I grew up. It was 1000 times worse, and just being able to know that I could have a positive effect on people out there, and being able to build with them was pretty great. It gives them a sense of hope, a sense of recognition. Sometimes when you have nothing, knowing that people know you exist makes a big difference in your life. It helps you to strive for something. For Bouncing Cats and beyond, how has traveling the world impacted you as a performer and as a person? The documentary is probably the thing I&apos;m most proud of, in terms of traveling, because it&apos;s not about me; it&apos;s about how hip-hop can be used as a tool for social justice, bring people together, bridging the gaps between cultures, and so many other things that allow us to exist on a better level as human beings. As a person, traveling has broadened my awareness of other people and other cultures. It has given me appreciation for things that I probably would never care for. Being able to meet those people in Uganda and understand who they are, and where they come from, and how they exist; it makes you more sensitive to what else is out there. I don&apos;t believe you can abandon culture or give up on culture, especially if you got into it for the sake of art and not making money. What was it like seeing the Rock Steady Crew perform in Central Park for the 37th anniversary? I didn&apos;t perform, I let the crew perform. I was chillin&apos;. But it was a great celebration. We had a lot of great artists perform. We had people like Slick Rick, Keith Murray, Das EFX, Onyx, Thirstin Howl the 3rd, and MyVerse, who is a new artist. We had a lot of surprises like Rahzel. We had all these people in the audience—from people in their 50s to little kids—which was a great thing. Do you ever miss competing or performing since you retired? No; for me, I don&apos;t have anything to prove. I know I said that I did my last performance, but if the performance is a smart thing for me to do, maybe I&apos;ll do it. It doesn&apos;t mean that you won&apos;t catch me at the club gettin&apos; down. I still get down; I still teach on a regular basis, so it&apos;s not like I have abandoned the art or the culture. I don&apos;t believe you can abandon culture or give up on culture, especially if you got into it for the sake of art and not making money. Maintain your education and take care of your family. In a previous interview, you said that you want to be more pro-active in the Puerto Rican community. How has the development of Puerto Rock Steady been since last year? Puerto Rock Steady has actually grown. It was a great event. We had La India and Kurtis Blow involved, and they both performed. I guess the biggest thing is really being able to establish the right connections with the government as well as local businesses that can support and make things happen. The event is bringing money into the community already; people are spending money, and we&apos;re already on the right track. Ultimately that&apos;s what I want to do. I&apos;m just happy to be able to do my part, and we&apos;re on the right path. I&apos;m going to be dealing with some of the higher ups in the government agency to discuss how we can make all of this a lot more successful. Do you have any advice for aspiring b-boys and the next generation? Yeah, stay in school. Develop your skills, get good at it; become great at it if you want. But don&apos;t give up school for some sort of idea that you&apos;re going to become some great b-boy or b-girl. At the end of the day, our body dictates our longevity, and if you get hurt being a b-boy or b-girl, that can put things to an end real fast. Maintain your education and take care of your family.